Tool Cabinets are used to accommodate and organize tools efficiently and with ease. These tool cabinets are very much suitable for industrial use. 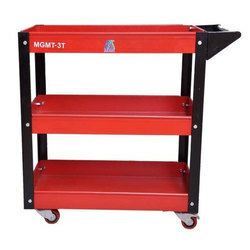 We offer best quality tools cabinet used in various industries. Our Iron Tool Storage Cabinet are made out of high quality material as per customized requirement. Our industrial expertise enables us to offer a wide collection of Cabinet Drawer, designed by our vendor's talented professionals using quality proven material and progressive machines as per the set guidelines of the entity. WE are instrumental in offering Mild Steel Furniture to our clients. The tool cabinet is a complete industrial products, required in major industires for keeping various tools and drawings. They can customized as per the end user requirements and are available in various sizes and dimensions. MGMT – 4D2C Tool Cabinet With 4 Drawer & 2 Cabinets. 1) An innovative design to suit your needs. 4) Top can be used as a workstation or for seating over. With the constant support of our expert team, we are engaged in offering a huge assortment of tool cabinet. This high grade tool cabinet is extensively used across different industrial sectors for various purposes. We take into account the variegated needs of our international clients and offer suitable range of tool cabinets. 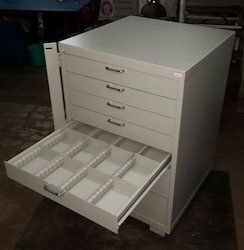 Maxstor as tool cabinet manufacturer in India, we understand the need and application of end users.Tool cabinet is a tool storage system which has multiple drawer having load carrying capacity upto 200 kg UDL.This drawer cabinet has divider and partition to keep all tool and spares in organised form. 1} Internal locking system for extra security. 2} Side locking device & automatic resetting of each drawer. 3} Vibration reducing corner, Side etray & plastic top. 4} 5" X2 " casters. 5} Ball bearing are used on the slide. Material: Prime Quality CRCA Sheet. Drawer sizes (W x D x H): : 1@ 590 x 410 x 200mm. We are offering Drawer Tool Cabinets to our clients.